Tyler LaCorata, left, and Rich Stabile of Long Island Spirits. There are two pretty cupolas atop Rich Stabile’s moss-green distillery and tasting room, but they aren’t simply attractive bits of architectural accoutrement. In this 100-plus-year-old former horse barn they served a particular purpose, outside of airing equine aromatics. “They were used at night to signal the bootleggers with lanterns coming in off the Long Island Sound,” says Stabile. The irony that his Long Island Spirits is the first legal distillery on the island is not lost on him—and he’s a long stretch from being the last. 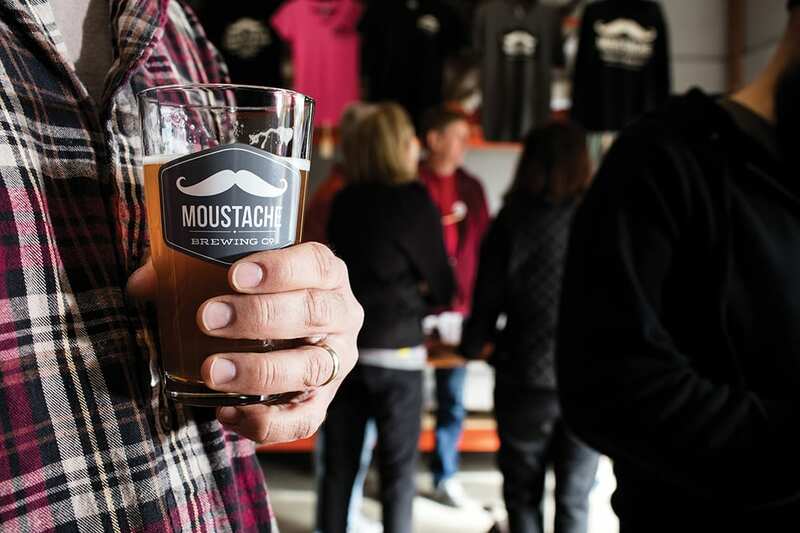 A cross-pollinating synergy on eastern Long Island runs like a summer Ferris wheel, scooping up more and more producers excited to come along for the giddy ride. Distillers reap local rye and finish aging it in barrels from Long Island wineries; winemakers morph fermented juice into eau de vie, brandy, gin and vermouth; craft brewers use everything from island-sourced hops and grain to local honey, beach plums, oysters and scallops for only-in-Long-Island brews; old farms find an entirely new purpose and lease on life. But while it may seem like a brave new brewed world, the heart of it all is rooted in the fertile Long Island soil. For Stabile, it all started with a potato. Or, maybe, everything kind of started with potatoes, which once claimed more than 70,000 acres at their height of production in the 1940s, from western Suffolk all the way down the chain of towns that run up and down the North Fork and the South (aka the Hamptons), carrying names of English settlers and Shinnecock Indians. “Being a native Long Islander, I wanted to work with local agricultural products to express the flavors that are native to Long Island,” says Stabile, who launched Long Island Spirits in 2007 with LiV, his clean, bright potato-based vodka. That same spirit is at the core of his Deepwell gin, as well as a sprightly line of “sorbetto” liqueurs that employ fruit grown at neighboring farms for their flavors. Not so long ago, Long Island ingredients rarely made it far past roadside farm stands or the menus at a few local eateries. Distilling—and, to lesser extent, brewing— have created a whole new cottage industry. Twin Stills Moonshine opened its tasting room and distillery in Riverhead this past March, sourcing local honey and fruit to flavor its line of liqueurs, and corn grown nearby for the base spirit that owner Joe Cunha makes in his Portuguese grandfather’s copper alembic still. About a mile down the road, Martha Clara Vineyards is preparing to release a brandy made from their grapes grown in Riverhead. 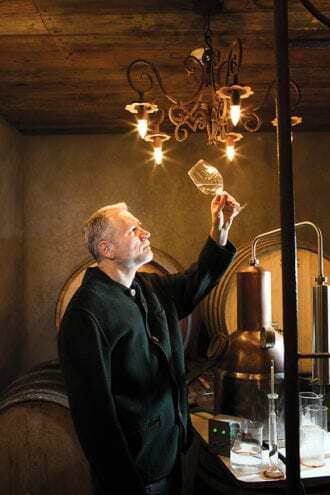 The tasting room at Shinn Estate Vineyards, five miles down the road in Mattituck, features a refined collection of brandies and eau de vie made by co-owner and winemaker David Page, and named for his bootlegging Wisconsin grandpa, Julius Drover. Page uses Shinn’s biodynamic-farmed grapes along with apples and pears from the Wickhams, a family that’s been farming here for 10 generations. S tabile also sources winter rye (a cover crop for the potatoes), corn, barley and oats for his whiskies from within a stone’s throw of his distillery, where he also began milling on site last year. Soon, he says, there will be a 3,200-square-foot-barn to house up to 2,000 barrels of whiskey: the island’s first rickhouse. Some of those barrels will have once held Long Island Merlot and Chardonnay, used to add a finishing layer of flavor to the Happy Warrior Cask Strength and Rough Rider bourbons. 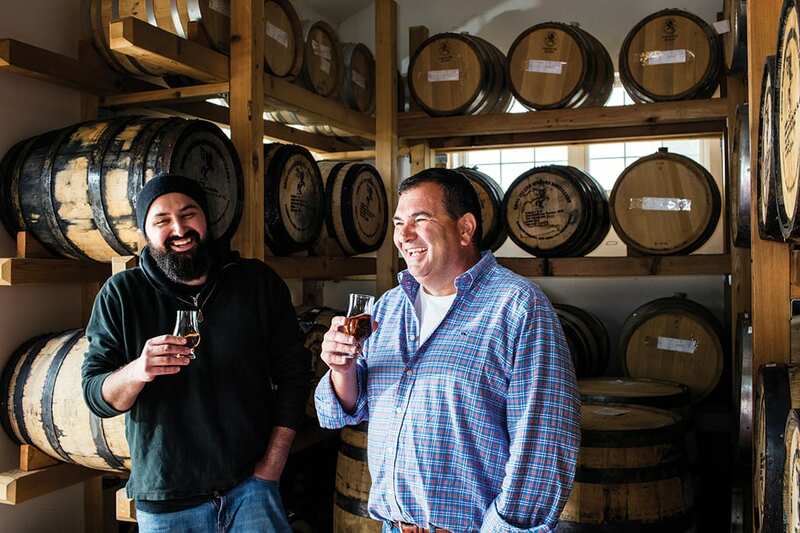 Tyler LaCorata, Stabile’s distiller, cut his teeth working the stills at Tuthilltown and brewing for Captain Lawrence, both in upstate New York, and that close connection between fermenting and distilling shows up in the single malt Pine Barrens whisky. Here, Tyler swaps an English-style ale for the standard mash, which he brews on site using a yeast strain from Long Ireland Beer Company, a few miles away in the town of Riverhead. In return, the brewers get used barrels from the Rough Rider bourbon to use for aging their whiskey stout. Long Ireland is working-class Riverhead’s first in a burgeoning crop of breweries that have popped up from the heart of West Main Street to Polish Town. The brew house and tasting room sit in a circa 1938 brick-and-stucco Agway building. “I’m a rusty nuts-and-bolts kind of guy. I hadn’t even sent an email before 2010,” says Long Ireland’s Dan Burke, a tall, burly barrel of a man who began home brewing as an outlet from his former day job as an oil-burner technician for Marran Oil in nearby Patchogue; his partner in the brewery, Greg Martin, was the service manager at Marran and brewed alongside Burke for fun. The two friends sketched out a plan, Burke sold his 1970s Chevelle and some Anheuser-Busch stock that he’d bought in his twenties for seed money, and by March 2009, they sold their first keg. Today, Long Ireland has about 12 mostly sessionable beers rotating on tap in their tasting room, with local-nodding names like Polishtown Pilsner and NoFo Farmhouse Ale; the beers are sold in both keg and bottle, with a plan to soon move to cans. 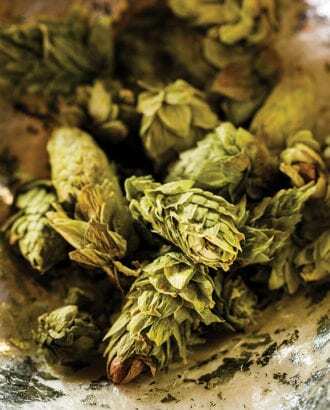 In August, they hold a fundraiser to help Long Island’s growing hop industry, brewing a special one-o called the Wet Hop Co-op; proceeds are donated to the farmers. It’s hard to find a bar or restaurant in eastern Long Island that isn’t pouring one of Greenport Harbor’s flagship brews (Black Duck Porter, Otherside IPA, and Greenport Harbor Ale)—and they’re pretty easy to find in nearby New York City, too. At the tasting room, beers like their annual Cuvasion—a Belgian-style ale that uses a different local grape variety in the mix every year—have been so in-demand that owners Rich Vandenburgh and John Liegey are getting ready to launch “a fully local beer series,” says Vandenburgh, which will exclusively employ Long Island–grown hops and grains. 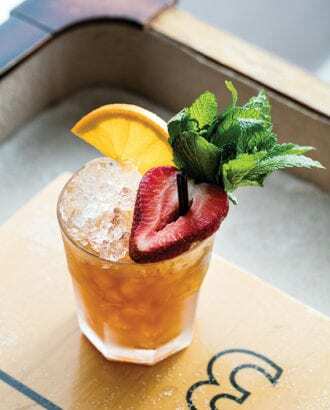 Brix & Rye is one of only a few cocktail-focused bars on Long Island. This local spirit was a big reason that barman Evan Bucholz left his job at Brooklyn’s Fort Defiance to open what may be the North Fork’s first dedicated craft-cocktail bar, Greenport’s subterranean Brix & Rye. But while the drinks are seriously good, the vibe isn’t city-stuffy. Here, locals and tourists and weekenders all engage amiably over cocktails. A Riverhead native, Bucholz sets the welcoming tone, and while the bar’s stock would impress even the most discerning drinker, Bucholz is finding more and more to pour that’s within driving distance of his Main Street watering hole. Shelter Island—the 27-square-mile amoebic-looking landmass between the North and South Forks—lived up to its name during Prohibition. Ships full of Champagne, whisky, and rum from Canada and the Caribbean would hover at the legal 12-mile distance from shore. After sunset, rum runners in speedboats brought the liquid contraband to what is now a nature preserve on Shelter Island’s quiet, secluded shores. Hull’s beers offer thoughtful nuance, like the fragrant saison-style Dune Cottage, brewed with elderflower, wild island rose hips and lemon thyme, with its gorgeous creamy texture and gently bitter bite balanced by a mild maltiness. Another of Hull’s beers, a smooth, English-style ale called 114, uses 55 pounds of grain, “a ton of hops and a ton of malt,” but it translates into something oddly smooth; simultaneously sweet and bitter, and full of that balance that Hull is good at achieving. Its name nods to the smooth main route that runs from the island’s North Ferry to the South and its quick, gliding passageway to the famed Hamptons, where families like the Fosters of Sagaponack have farmed for five generations. German-born winemaker Roman Roth distills the Wölffer Estate rosé into gin. Here, on 23 acres of land, Dean Foster and his distiller cousin-in-law, Matt Beamer—a former brewer for Wasatch Brewpub in Park City, Utah—are launching Sagaponack Farm Distillery, with an on-premise malting house soon to follow. Foster plans to use rye and other grains he grows for whiskey, but the first product, a vodka, makes use of the long-time Foster family bread-and-butter crop: potatoes. Instead of the standard, brown-skinned Long Island spud, though, Foster prefers an Irish round potato with light-colored flesh for its creaminess. About a mile down the road is Wölffer Estate Vineyard, which earned its local fame via a juicy, gulpable rosé. But that particular wine has become the surprise source of something else that German-born winemaker Roman Roth has been eager to make since he first learned distilling in his home country many years ago: gin. Roth distills it in a tiny, 13-liter German-made Carl still in the winery’s cellar, surrounded by sleeping barrels of Merlot, Cabernet Franc, and Chardonnay. His only botanical is juniper, which grows right outside the winery’s front door and is directly added during distillation for a pure, aromatic kick. Roth has made brandy, too, with Chardonnay as its base, and the spirit is currently napping in new Hungarian oak barrels. Montauk’s nickname has long been known as The End. But here, a stone’s throw from its eponymous lighthouse that gleams out into the Atlantic signaling the way home, it appears that maybe it’s only the thirsty beginning. A session ale that captures those Aprés ski vibes.